Indeed, it's perilous to chase growth across borders. Because a global market's dimensions are wider and less defined than a nation's or a region's, firms face a higher risk of frittering away the advantages they have secured on smaller playing fields. If a company wants to grow and still maintain superior returns, the appropriate strategy is to assemble and dominate a series of discrete but preferably contiguous markets and then expand only at their edges. We talk a great deal about taking risks at Citizen Agency, but what we really mean to encourage is taking smart and responsible risks. I know, it sounds a bit like a cop-out, but it isn't. Years ago, I had a very lovely consultancy in my hometown of Calgary, Alberta called Rogue Strategies. It was pretty young, but cooking right along...starting to win awards and launch pretty significant campaigns that were getting good attention. A smart move would have been for me to use that to my advantage to continue to grow in my current market and start to edge a little ways outside of it...pitching clients in the markets closeby. Instead, I got cocky and jumped right over to Toronto, where I thought the action was. Heck, I was moving and shaking in Calgary, why not Toronto? Wrong. Quickly, I noticed that I was a fish out of water. The landscape was entirely different. There were new players and attitudes and politics I didn't know how to navigate through. I would meet people who were excited about my work, but, ultimately, I didn't have a reputation in the market, so I was an unsafe bet. I had few contacts and even fewer opportunities. It all imploded after about 8 months and I took a job with a part-time client of mine. I learnt a great deal. Starting Rogue Strategies was a great risk. I knew people in Calgary. I had worked on campaigns there and had loyal customers. People knew what I was capable of, so they were more willing to take a risk on me, too. Sure, it could have imploded there, too, but the chances were better for me and my business and I could use my social capital to get over the initial uncertain period. Instead of concentrating on holding it all together, I could spend more time on keeping my eyes open to the opportunities that came along for me. Now that I'm consulting again, I remember this lesson. I knew I wasn't going to move to San Francisco and just hit 'go'. I had to establish myself here, working with a startup who had was willing to take a risk on me and my ideas. Then I needed to PROVE myself, so I was transparent and documented everything openly and showed how things worked and didn't all along. At the end of the day, I was able to achieve a more than reasonable success (that whole million photos uploaded on day 1 thing, then 10 million in 3 months), which people took note of. Part of the success I was able to achieve at Riya was also due to my involvement and contributions to the local community as well, which I made a priority. By the time I was ready to leave Riya, I had established enough 'whuffie' that starting Citizen Agency made sense. But it didn't happen overnight and it certainly wasn't easy. We get loads of questions from people on how they can achieve overnight success ("You've come out of nowhere"). The truth is, the climb was fast, but there were a load of factors that were in place at the time I got here that are no longer present. Like early in the 'Web 2.0' craze and more accessibility to audiences (now that there are, what, like 100 million + blogs, the mountains of readers have turned into molehills). It takes a willing commitment and long term dedication to a very give and take relationship with the marketplace. It's very much like being a local merchant. You need to establish trust and reputation and build relationships with the people in your community. This doesn't happen overnight. Now, if we decided at this very moment that we want to, all of a sudden, move into entertainment marketing or communities, we would probably fail miserably. Why? Well, it isn't that we couldn't actually apply some great lessons that we have learnt from this industry into that one, it's that we have no reputation in that one, so, even if we did get our foot in the door, following our ideas would probably be too risky for someone anyway. We know we still have so much to learn and do in our own wee niche of web technology and startups. Growth happens slowly and tangentially. 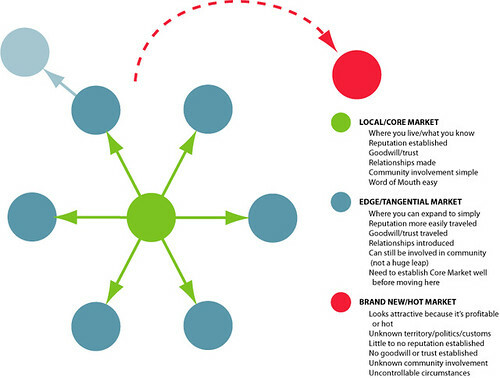 Occasionally it will jump over to a totally different industry or locale, but it's rare and you can usually trace it back to a very close human connection between the core/local market and that one. If you want to seed growth, it is better to look to the edges of the market you are already seeing success in. AND an even SMARTER move is to give the current market the chance to grow to the edges organically. This will be your strongest indicator of a successful expansion. When it happens, garden it and foster it along. If it hasn't moved along yet, you may still have loads of work to do on your core market. You have to continue to fertilize the roots. Without your roots, you fragment the edge markets and risk losing your strongest reputation market (or alienating it, which will find its way through the branches). So, if you HAVE to grow (and ask yourself if you are ready for that yet, 'cause growing for the sake of growing is not a strategically smart move), grow smart. Grow to the edges.